Scientists are saying they expect to document over 100 right whales in the Bay of Fundy this year, a welcome sign after several years of decline. "The bay seems much more alive this year than the past five," said Moira Brown, senior scientist with the Canadian Whale Institute, in an email. Brown says surveyors also noted higher numbers of seabirds and harbour porpoises as well as minke, finback and humpback whales. 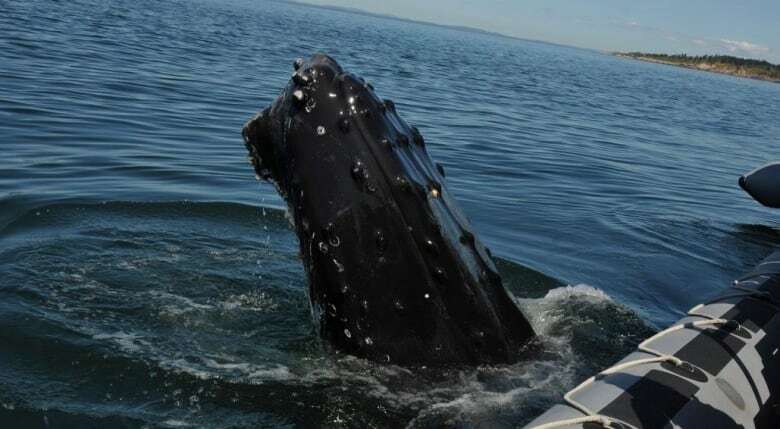 Whale watchers on board the Jolly Breeze near the Wolves Island Nature Preserve, between Blacks Harbour and Grand Manan Island, got within two feet of a humpback last Sunday. Hannah Skinner wrestled her phone out in time to get video of the whale as it dove underneath the boat. "Seeing this huge gentle giant who was so peaceful, made me feel small ... in a good way," said Skinner. The humpback was roughly 35 feet long. Operators of the Jolly Breeze, Rob and Joanne Carney, say it was a 2015 calf. According to Brown, right whale presence this year is back where it had been for several decades until the recent drop. They are remaining longer in the area this year as well. "This year the water temperature was more in the normal range that we would expect for the Bay of Fundy," said Laurie Murison, executive director of the Grand Manan Whale & Seabird Research Centre. In addition to temperatures, herring and phytoplankton on the northern side of Grand Manan are healthier, and drawing back the whales to feed. In fact, Grand Manan ferry passengers are seeing an increase in wildlife in general said Murison. This news contrasts the tumbling puffin chick population on Machias Seal Island, south of Grand Manan. The Grand Manan Whale & Seabird Research Centre is currently using oceanographic temperature probes, with the help of area lobster fishermen, to look for answers. Murison hopes their probe this summer will provide useful data about whether water temperature has something to do with why puffins aren't getting at the herring that feeds their chicks.